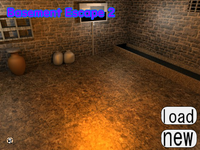 InfoWeb - Dassyutu Game: Basement Escape 2 is another Japanese point and click escape the room game developed by Info Web. You are trapped in a room and you have to search around to find some clues and solve puzzles to escape. Good luck and have fun! I have key, bucket,batteries, screws and stick; already used panel, ladder and button; missing hook for stick and hints for safes and doors. And have 7 coins. Actually two places in inventory empty. One of the coins is impossible to see, it's in the mousehole and needs some wild clicking to find. Somewhere above the colour clue. Still a decent game though. Have empty bucket and key remaining. Can see dusty object in mousehole but cannot do anything with it. Tried to fill bucket with water, but cannot seem to do it. Help? Missed one hot spot - look carefully at the side of the shelves, otherwise the clue won't work! Here I am playing a day late. Thanks for the great hints everyone!